The book that everyone has been waiting for . 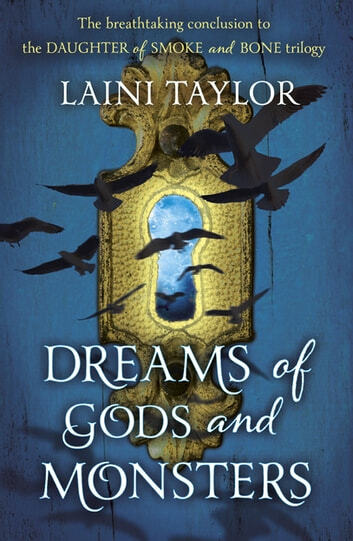 . . the much anticipated final novel in Laini Taylor's breathtakingly imaginative Daughter of Smoke and Bone series, DREAMS OF GODS AND MONSTERS By way of a staggering deception, Karou has taken control of the chimaera rebellion and is intent on steering its course away from dead-end vengeance. The future rests on her, if there can even be a future for the chimaera in war-ravaged Eretz. Common enemy, common cause. When Jael's brutal seraph army trespasses into the human world, the unthinkable becomes essential, and Karou and Akiva must ally their enemy armies against the threat. It is a twisted version of their long-ago dream, and they begin to hope that it might forge a way forward for their people. And, perhaps, for themselves. Toward a new way of living, and maybe even love. But there are bigger threats than Jael in the offing. A vicious queen is hunting Akiva, and, in the skies of Eretz ... something is happening. Massive stains are spreading like bruises from horizon to horizon; the great winged stormhunters are gathering as if summoned, ceaselessly circling, and a deep sense of wrong pervades the world. What power can bruise the sky? From the streets of Rome to the caves of the Kirin and beyond, humans, chimaera and seraphim will fight, strive, love, and die in an epic theater that transcends good and evil, right and wrong, friend and enemy. 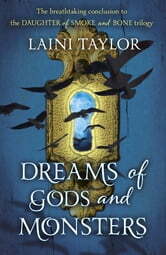 At the very barriers of space and time, what do gods and monsters dream of? And does anything else matter? I've missed Karou and Akiva, and Mik and Neek-Neek. It's left me wanting to know the end. I'm very sad that the trilogy has ended. What more can I say other than you can feel the warmth coming from this story it's crafting is addictive! The characters are so deep and real and the plot so beautifully written and unpredictable. It all comes together so perfectly in this final instalment. Ms Taylor is a phenomenal writer!